Wouldn’t you agree that gardens are enhanced with the addition of birds? When you set a birdbath, hummingbird feeder, birdhouses or seed you are guaranteed to get a variety of birds all throughout the year. Where I live the winters are LONG. Let’s just say the last of the snow has finally melted…that long. During these cold and snowy winter months birds need an extra addition of fat to help them survive. 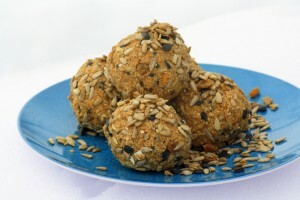 I was able to keep many birds happy with this easy peanut butter bird seed ball recipe from Kate Seaver, Kate’s Garden. 1. Combine all ingredients except cornmeal in a bowl. Add enough cornmeal to hold mixture together. 2. Form into balls or bricks, then freeze overnight. 3. Place on feeder to keep furry critters at bay, mount on a suet ball feeder, garden stake or bent coat hanger will work, too. If you’ve shape into brick then use a suet basket. 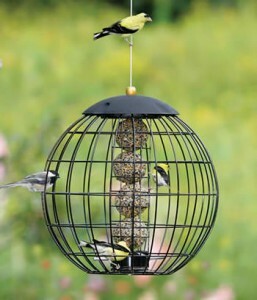 Or invest in one of these fancy feeders and hang several balls at once. Okay, you scared me there! Glad to know you weren’t feeding the birds martinis. Great recipe to have as the birds are coming back home. I have several feeders, and much prefer making my own food for them. Thanks for the recipe! When I’m done with it, I’ll sit back & have a martini myself. I admit it did smell good when I was making it, hehe. Very cool bird seed balls! My lil one and I would have lots of fun making those! Hi Jenn! Yes, your little ones will have a great time making this recipe! This is an awesome way to use up some of the oats and flour that I have left over from when I ate wheat gluten regularly! Thanks for this recipe. Thanks for stopping by Genevieve. I’m happy you’re able to put your flour and oats to good use. I’ll have to make some this weekend they are calling for rain (fingers crossed) and this will be the perfect thing to occupy my time. Your birds will love the balls Annie!!! I have one of these thunder dome feeders! Making seed balls for it this week now.